Having bags under your eyes is not only unsightly because of the years it adds to your appearance, it is also occasionally physically uncomfortable. To rid yourself of this problem and to prevent it from happening in the future, it helps to know what causes these bags under your eyes in the first place. Usually, bags under the eyes indicates a water build up under the skin. Fluids come in and out of the area under eyes naturally but is easily visible because the skin under the eye is quite thin. Having a cold, sinus infection or allergic reaction might cause puffy eyes, especially in the mornings. Additionally, salty foods or a lack of sleep may also cause bags under eyes. Typically, however, bags under eyes form as a natural part of aging. The skin under your eyes becomes thinner as you grow older, leaving the orbital bone under your eye more visible. Skin all over your body begins to sag as you age because it loses elasticity, but the skin under your eyes often sags first because of its delicate, thin nature. Depending on your overall health, amount of exercise and drinking and smoking habits, this phase of sagging eye skin may occur as early as your 30s or 40s. However, most adults first acquire permanent puffy or baggy eyes in their 50s or 60s. It is crucial to note that smoking a leading cause of bags under eyes. Smoking is known to negatively affect the skin by creating excessive wrinkles and sagging. Ultraviolet light has similar effects, so apply sunscreen to the area just below your eyes whenever you are out in the sun to help prevent bags under your eyes. Luckily, there is plenty that you can do to combat the bags under your eyes. If your baggy eyes are of the temporary sort, place cold cucumber slices on your eyes while you nap. The cool cucumber works to reduce any swelling under your eyes. Sleeping on your back with your head elevated on a pillow or two also helps drain fluids from your eyes. Another easy method to reduce eye swelling and bags under eyes is to use a topical eye cream or anti-aging cream such as Vivexin. Medical experts suggest that these types of creams, when applied regularly, are some of the best options when it comes to reducing and eliminating bags under eyes. 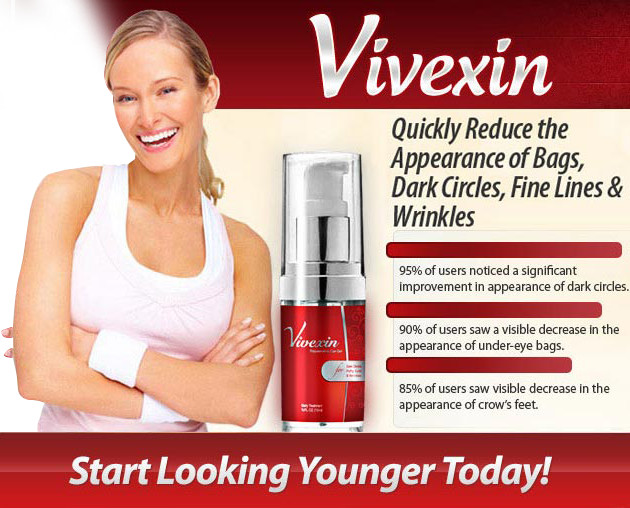 Start seeing results in just a week or two with Vivexin's line of eye care products. Luckily, Vivexin is a product that works for people of all skin types, including sensitive skin. It may be used in tandem with makeup so that you feel comfortable applying your daily blush, mascara and more. 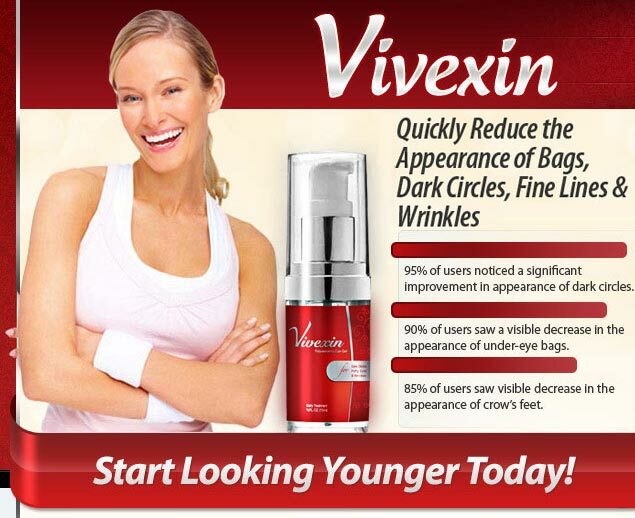 Nearly all customers who have tried Vivexin say they look much younger after starting to use the cream, so visit www.vivexin.com today if you are struggling to conceal the bags under your eyes. 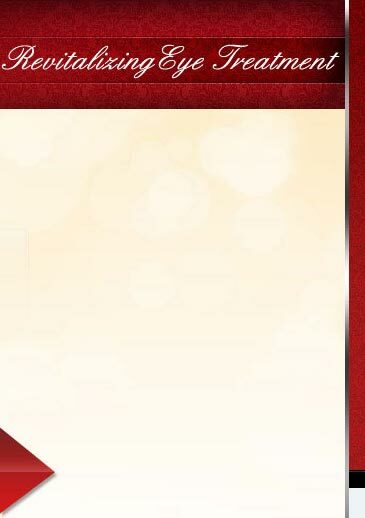 The product is affordable, safe to use and is backed by a 90 day money-back guarantee.